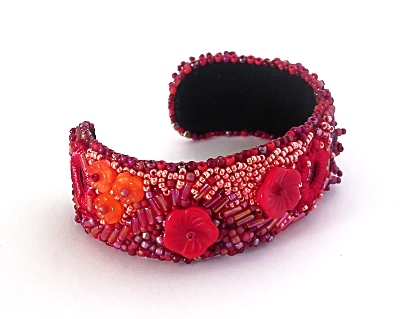 This bead embroidery cuff just seemed to grow! As soon as I began adding the beads it took on a life of its own and the beads seemed to choose themselves. Some of the items I embroidered onto the cuff included; various sizes of seed beads, cubes, sequins, flower and bugle beads and shisha mirrors. You can see the other side of the cuff here.